*Click on the link above to see what I came up with on her blog! I am very excited to be doing this guest post today. 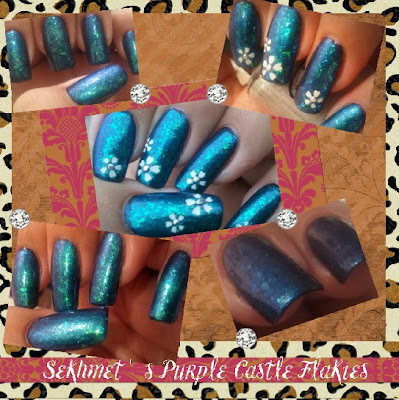 I'm Lydia from Sekhmet's Purple Caste and I'm completely in love with all things nail related! This is my first guest post and I feel so honored! I want to thank Esme for having me over on her blog! The second day of our challenge is here and I have some flakies for you guys! Hope you guys like it! I like how easy they are to remove compared to glitter polishes! thanks :) be sure to follow Lydia's blog & mine!! !